Ask Dr. Nandi: When should we really be worried about the measles? News of the recent measles outbreak in Oakland County has many parents on edge, wondering what may happen next. 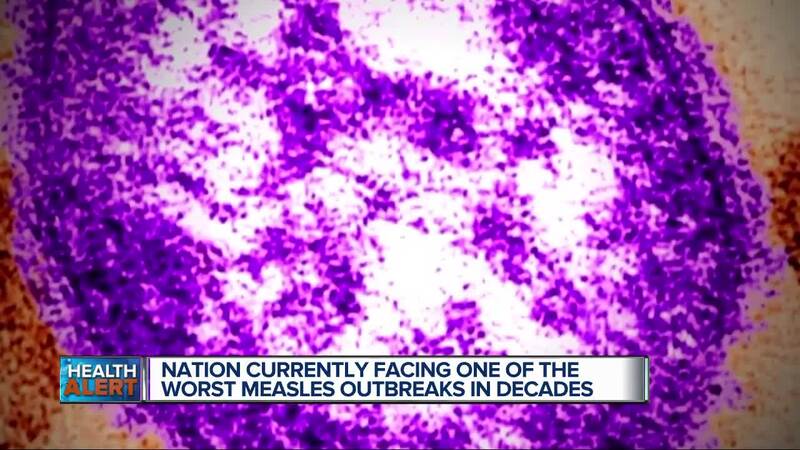 (WXYZ) — News of the recent measles outbreak in Oakland County has many parents on edge, wondering what may happen next. I can see why many people are concerned, especially parents. Now I would be watchful but not overly worried if you and your children have received the measles vaccine. And why I want you to still be on guard and alert is because the MMR vaccine that helps protects us against measles is not 100% effective, it’s 97% effective. And despite that’s being a high number, it still means that 3 out of 100 who are immunized can become infected. So if you’ve been to any of the locations reported by State health officials and are concerned about the possibility of being infected, I would call your family doctor to discuss your next steps. Now this is really important to do if you have a child under the age of 5, if you’re taking immune suppressant medication or have a medical condition like cancer or tuberculosis. And the reason why is because serious complications are more likely to happen with these groups. Looking at statistics, the CDC says that 1 in every 20 children who get measles will develop pneumonia. 1 in 1,000 will develop swelling of the brain and 1 or 2 children out of 1,000 will die. So it’s vital that anyone with measles is monitored closely for things like bronchitis, laryngitis, fast or difficulty breathing, wheezing, chest pain, vomiting, and convulsions. Those symptoms need medical attention right away. What does it take to have a state of emergency declared like we are seeing in other states? A state of emergency is only declared when it’s believed a disaster has happened or is close to happening. It basically warns residents and brings attention to the issue. It also alerts our state authorities so that they are ready to respond. Now recently a state of emergency was declared in Rockland County, New York where they have 153 confirmed cases. Let’s compare that to here. Last year there were 19 reported cases of measles, and so far this year, there have been 33 cases reported. So yes, the numbers are already higher, but overall still low. So I think we still have a ways to go before a state of emergency gets declared here. But let's hope that never has to happen, and getting immunized will certainly help with this.